splatters it, blows it, scrapes it off the canvas, wipes it around, and more. Like many artists, Dana Sterzinger draws inspiration from the greats – namely Jackson Pollack, Pablo Picasso, and Salvador Dali. But unlike other area artists, she also draws inspiration from a 1960s artistic movement that incorporates elements of dance into the creative process. 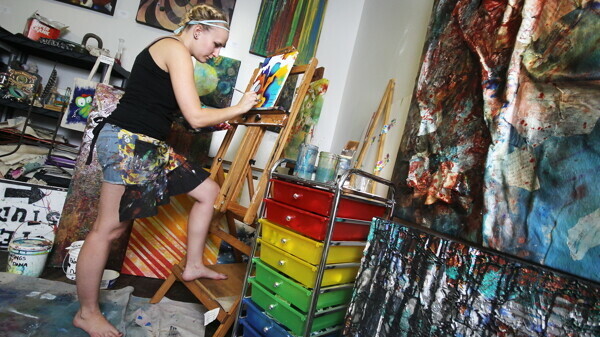 What makes Sterzinger’s work different from what you may have seen is how she goes about applying the paint to canvas. “Basically, I try to find as many different ways to apply paint as I can without using a brush,” she says. As she pirouettes around the canvas Sterzinger dumps the paint, pours it, splatters it, blows it, scrapes it off the canvas, wipes it around with a rag, rakes it with a fork, marks it with mason jars, and mixes it with oil to create one-of-a-kind abstract pieces. Sterzinger also creates relief and texture by starting the painting prior to stretching it onto the support system so when it is stretched the dried paint splinters and cracks to create varying painting surfaces. Each of Sterzinger’s pieces are blanketed with thick layers of color and an assortment of applied textures which work in harmony to create visually enticing works of art. Though her pieces are wild and abstract, Sterzinger says they still act as her voice, and help articulate life’s sentiments out of her head and onto her canvas. “My work comes from a very emotional place,” Sterzinger explains. Sterzinger will be opening her Banbury Place studio August 9-11 for anyone interested in seeing her process or merely to have the chance to poke around her workshop. Sterzinger says spectators will get to witness her unorthodox ways of painting, and can chime in and give feedback on the work as it’s being created.